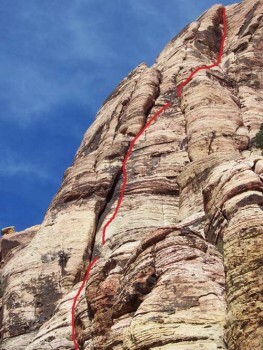 Olive Oil is one of the best Red Rocks moderates with its excellent, varied climbing on great rock. The long, awesome crack on the second and third pitches, some routefinding on easier terrain, and a final huge stemming dihedral all add up to a great day. With some runout sections at 5.7, it is not a good climb to break into that grade. Which SuperTopo guidebooks include a topo for Olive Oil? FA: George and Joanne Urioste, John Williamson, 2/78. Portions may have been climbed by Joe Herbst & Larry Hamilton, 1/76, during FA of Rose Tower. John Williamson was one of Red Rocks’ original pioneers, but he had been out of Las Vegas since the early 1970s. During a visit in 1978 he teamed up with George and Joanne Urioste for several routes. Olive Oil is most notable to today’s climbers for its clean rock and moderate difficulties. In his younger days, John would often acquire climbing partners by introducing some innocent friend to the sport. Frequently they were overwhelmed by his drive and enthusiasm, so John was especially happy to meet the Uriostes, who were at least as overboard as he was.